This summer I’ve spent my time, so far, exploring what’s on my doorstep. I’ve lived in Cornwall for almost thirteen years, and have ignored so much of what’s really here. I constantly dream of sunny skies, which we’re not always graced with here in Cornwall, unusual landscapes, fairy-tale castles, hiking glaciers… you get the idea. But this summer I decided to stop being blind to those incredible spots around me, and have explored areas in Cornwall that I hadn’t yet seen and/or didn’t even know existed, or had visited maybe once or twice and then never returned ever again – forgotten spots and lost treasures, we’ll call them. Where did I make a start? Along the coastline – where else?! The (not so aesthetically pleasing) little town that I live in is surrounded by seven beaches (that I know of), and they are all within a ten minute drive. Lucky me! However. I’ve not been to a beach in forever. Why not? Well, they’re rammed with tourists in the summer, and wet wet wet in the winter. I’m missing out. Big time. Especially when you avoid the over-populated beaches and head for those less frequented. Let me tell you about my new favourite little beach, Porthluney (also known as Caerhays). I arrived at the beach at 7.30am to explore uninterrupted, and it was well worth the early rise. The temperature was already 20 degrees, the tide was so far out, and the sea was clear… and warm! I even managed to sneak around the rocks, without having to swim, to find a little cave spot. I set up a temporary camp here, amongst the rocks covered in masses of beautiful mussels, whilst I explored and snapped some photos for my Instagram (which you can find here: @perfectlyclaudia). There were a few dogs and their owners also roaming the beach, but it was perfectly peaceful. The sand was lovely, and I was very happily in and out of the water without making that cringing face of sheer terror that we all make when the water is ice cold. It was beautiful. The tide however didn’t take long to come in, and I had to give up my secluded little spot. I paddled through the ankle-high water back to the main part of the beach. I’m glad I got up when I did, because the tide moved quickly and I’d have been scrambling tall rocks otherwise. Even at full tide the water was still clear, with an array of little fish swimming around. The super soft sand of the morning had gone, and all that was left were fine grains – though still far easier to walk on than Charlestown’s pebbly obstacle course. Caerhay’s Castle is just across the road (explorable only in spring) and is easily visible from Caerhay’s Cafe… which is perfectly positioned on the beach. The cafe even has a little secluded, rustic seating area in direct view of the sea, dreamy. 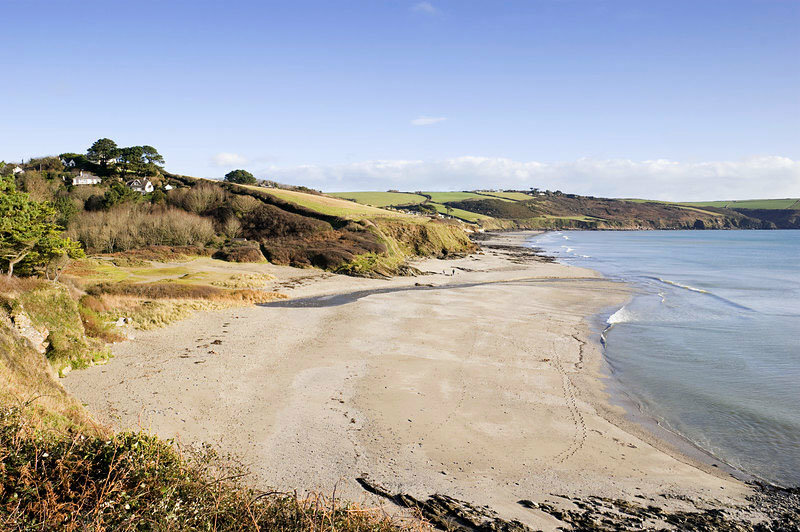 If you’re strapped for cash, want a quiet few moments, need to clear your head with a sea-view walk, need that morning run, are dying for a new reading spot, or want a fun day on the sand, then the beaches of Cornwall really are a dreamy place to do all of the above. You can even walk from beach to beach along the coastal paths (just make sure to wear appropriate footwear in the winter… I almost lost one of my favourite boots in the mud earlier this year). There are still a few beaches further along the coast that I’m yet to visit, and am really dying to stroll along – Porthcurno, Bedruthen Steps, Godrevy… I need to get a move on, before the regular wet and windy Cornwall weather returns!